The 7520 is a holster for electronic discharge weapons (EDW) only. 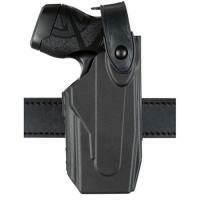 The holster features the Self-Locking System (SLS) allowing for a smoother, single-motion draw. The hood can only be released by being simultaneously pushed and rotated forward. This model is constructed of the innovative SafariSeven material, a unique nylon blend from DuPont. SafariSeven is highly durable and practically impervious to the elements. It offers both strong side and cross draw carry, and features a user-adjustable belt loop for various carry angles on the belt. Fits belt widths from 1.5 in. (38 mm) to 2.25 in. (58 mm).